Enhance the value and appeal of your home with our broad selection of hardwood flooring in St. Paul, MN. When the flooring in your home begins to fade and wear, replacing your floors with our sturdy and stunning hardwoods is now more affordable than ever. Investing in hardwood floors creates an atmosphere of sophistication and style in any room or area of your home. This versatile type of flooring can be incorporated into any design plan you have created, and our friendly sales associates are ready to answer any questions you may have. Eliminate the guesswork involved in choosing the right type of hardwood for your home and family. Our team takes the time to listen to you, so that we understand the right product for your home. We provide you with options that fit your overall approach to style, as well as your available budget. At every step of your design journey, we are there and focused on your complete satisfaction. With our approach to design and installation, you can realize additional cost savings that help you expand your design horizon. Get the type of wood flooring that can stand the test of time, so you can enjoy an exceptional living experience for years to come. Every homeowner has his or her own unique design style. As a locally owned store, we make sure that the design tastes of our local customers are represented in our collection of hardwood flooring. No matter what type of look you want for your home, you’re sure to find a flooring pattern and style that meets your aesthetic and functional needs. It is important to consider every aspect of your design plan when choosing the right flooring for each room. Get the appeal and durability of wood flooring without spending a fortune when you choose from our selection of engineered hardwood. This flooring has the same look and feel as traditional wood flooring, and at pricing that makes sense. It is created by combining several layers of natural wood. This creates a durable surface that is affordable as well, which easily allows you to expand the area of flooring you are replacing. Engineered hardwood is also known for its somewhat eco-friendly qualities. With a manufacturing process that utilizes recycled materials from the floors of old buildings, fewer trees are being used to make the wood. This also makes the floors stronger because wood that comes from old trees that grow slowly, rather than plantation-grown trees, is heavier and harder. Additionally, these floors that are made without formaldehyde limit your exposure to toxic chemicals. These reasons make a huge difference in protecting our environment. Create a uniform look that fits your favorite room perfectly with the help of our solid hardwood flooring. Enhance the aesthetic feel of any room you renovate with a solid wood floor without any seams. This helps you keep your floor clean without hours of maintenance. These floors also allow you to create a look unlike any other. Each hardwood floor has a unique and natural pattern that cannot be duplicated. 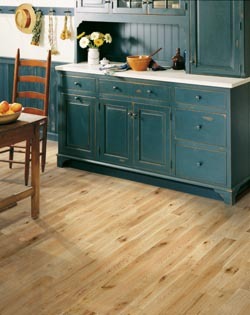 If you ever become tired of this pattern, you can easily sand down this type of flooring and refinish it several times. This product offers increased durability and flexibility over its lifetime in your home, which helps you extend the life of your flooring investment, and saves you money in the long run. Solid hardwood floors are also easier to clean. In addition, without the need for harsh cleaners and shampoos, the air quality in your home will improve with our hardwood flooring. Take advantage of other options that help you create an interior that matches your style and approach to life. No matter what type of approach your design plan incorporates, our selection of hardwoods allows you to enhance your room with distinctive style and rustic charm. For example, our handscraped hardwood is perfect when you want a rustic look in your living room and den. This variety of flooring features a natural texture that speaks to an appreciation of a time gone by. If you want to redesign the interior décor of your home to reflect a vintage bungalow look, we have the varieties of handscraped hardwood you are looking for. Infuse your home or office with authentic character with a flooring choice unlike anything you have ever seen. Some of the top manufacturers we work with include Armstrong, Mohawk, and Design Distinctions. One of the many benefits that comes with choosing handscraped, solid, or engineered flooring, is its low maintenance. All you need to do is sweep or vacuum on a regular basis. You can also use recommended hardwood cleaners to keep your floors gleaming all of the time. Wood flooring is also great for high-traffic areas. Scuffs, dents, scratches, and scrapes are common occurrences in busy households, particularly those with small children and pets. The great thing about hardwood is that it can often be repaired fairly easily. All you need to do is sand, smoothen, and refinish it. It’s rare that hardwood floors need to be replaced. They also create a healthier environment for you and your family. Dust and other particles have nowhere to hide in wood floors. This is especially beneficial for those who suffer from allergies and have respiratory issues, such as asthma. Bring in your design plan and any samples you have, so our sales team can help you choose the right options for you. The only limit to your flooring experience is the bounds of your imagination. With competitive rates on hardwood flooring installation, it makes sense to entrust your flooring investment to the professionals. Your home or office is a unique space, and only a trained professional has the tools and experience needed to get the right fit each and every time. We know what it takes to get the job done on schedule that doesn’t leave you waiting any longer than you have to experience the feeling of walking on your brand new floors. Protect your new flooring from moisture damage and needless wear when you have your floors installed by our team of specialists. We focus on your complete satisfaction and our professional installation helps you extend the lifetime of this investment. With this level of installation, you save money in the long run. We are committed to seeing you happy with both our installation process and our prices. We refuse to be outsold by our competitors and make every effort to ensure that doesn’t happen. That’s why we offer a Price Protection Guarantee. If you purchase a product from us and find that same exact product at a competitor’s store for a lower price, let us know. We’ll happily refund the difference. We also offer a Lifetime Installation Guarantee. We have every confidence in the work of our installers. However, if you ever have any issues that are related to the installation, let us know and we’ll make it right at our own expense. Everyone at our flooring store is dedicated to making sure you enjoy your floors for many years to come. We are positive that when anyone you invite into your home sees the difference our flooring makes, they are certain to want to visit our showroom themselves. Our team is proud of the job we perform every day. With every step in your design journey, you get the support you need to make a difference in your home. Depend on our flooring associates to help you find the right surface for your home. Contact us today to learn more about hardwood flooring. We proudly serve residents in St. Paul, Minneapolis, Maplewood, Woodbury, and Cottage Grove, Minnesota, as well as those in the surrounding areas.